Sally Hensley’s father would always ask her, “When are you coming back to the real world?,” but in her mind, Crested Butte was as real as it gets. Sally was raised to appreciate the outdoors and thrive in an off-the-grid lifestyle during her childhood summers in the woods around the lake region of Michigan. Experiencing that freedom and beauty as a kid, when she arrived in the mountains of Crested Butte she naturally found it to be the perfect home. She was raised in Minneapolis, and she and her family took advantage of the city’s many lakes, especially in her neighborhood, where everything was connected by bike paths and the open green space of parks. When she and her two sisters were young they’d ice skate on the creeks, gliding on narrow paths to get to the lakes. The frozen channels allowed them to skate sometimes for miles. In the summer, the family would head off to the solitude of their grandparents’ isolated Amen Lake property near Grand Rapids, Mich. The property was several miles down an abandoned and rough logging road where the mosquitoes seemed more like large rodents. There was a little fishing cabin where the wind would blow the mosquitoes away and her grandfather declared, “Amen, I’m home.” To this day, there’s still no electricity on the property, and the road has become impassable so now the family boats over from the parking area of the accessible side of the lake. But Sally loved the secluded lifestyle, playing in the woods, swimming in the lake, fishing with her grandfather and she still spends at least a week there every summer. “My dream is to be able to go for a month every summer. We’re in the middle of national forest. It continues to be a huge part of who I am today. I’ve had more S’mores in my life than any Girl Scout,” she grins. After graduation from Tufts in 1987, Sally grabbed her degree in child study, packed up the car and drove out to Colorado. She and two of her college mates from Tufts drove around the state looking for a small ski town to settle into. “We looked at Steamboat, Vail, Aspen, and Telluride, and we thought Telluride was it. But we had trouble finding a place to live so we went for a hike up to the base of Bridal Veil Falls, where we found a dead body, so that was it for Telluride. We packed up and drove to Crested Butte.” The body, they were later told, was apparently left over from a Grateful Dead show two weeks prior. The trio of college pals moved into a condo at upper Eagle’s Nest on the mountain and Sally was working as a waitress at the Artichoke (now The Avalanche), and as a ski instructor for the town’s Learn to Ski program run by Jerry Deverall. She volunteered at Stepping Stones and the Crested Butte elementary school, which, at the time, was where the town offices are now. Later, she worked at Le Bosquet. “All the jobs I needed to pay the rent,” she smiles. “Eventually, I became a teacher and the director of Stepping Stones,” she counted 17 years there. Afterwards, in 2006, she became a teacher for the Gunnison RE1J schools and director of Lake Preschool, during which time she enrolled in a master’s degree program at Regis online, earning her M.A. in educational leadership and a principal’s license, which entailed an internship that ran concurrent to her directorship at Lake Preschool. 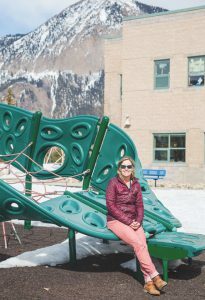 Sally became the principal of the Gunnison Elementary School in 2011 and from there she was hired as the elementary school principal at Crested Butte Community School in 2015. She met her husband, Chris Hensley (current director of the Adaptive Sports Center), while playing pool at Kochevar’s in 1990, but it wasn’t until a year later that they started dating. They married in 1996 with the ceremony officiated by both Glo Cunningham and Jim Starr. Their wedding band, Sally boasts, was String Cheese Incident, a stroke of timing and luck since they made the big time right afterwards. The couple has two sons: Gus was born in 1998 and Michael came along in 2000. Both grew up here and went through the Crested Butte schools.